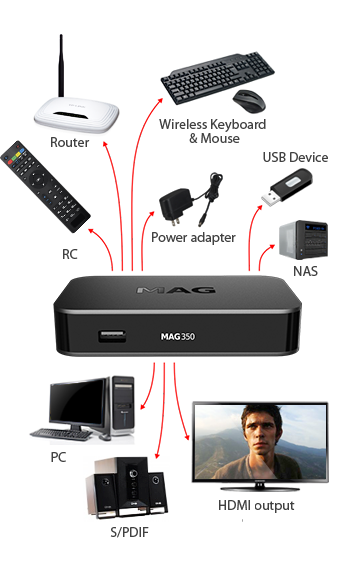 MAG349/350 is equipped with video compression technology, used to play back video of high quality. MAG349/350 is equipped with a dual band Wi-Fi module, Bluetooth 4.0 LE and USB 2.0 ports. This expands the Internet connection and external carriers’ usage opportunities. The multi-purpose remote control allows managing not only the Set-Top Box, but also operation of other devices. You can connect a wireless keyboard and mouse through a USB port for more comfort when operating MAG349/350. The Set-Top Box MAG349/350 can be connected both through HDMI and RCA cables. Il est très réactif. Super produit.